As Ron Burgundy once stated: "That escalated quickly" - though maybe 'declined' would be more fitting in this instance. Twitter has today announced its 2017 Q2 earnings. And they're not good, the signs are not great for the company's ongoing prospects, sparking a wave of coverage and market activity. 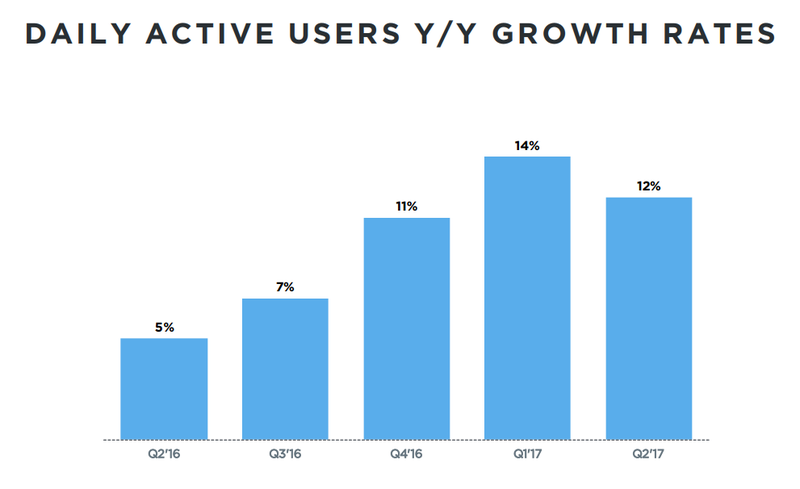 First off, on usage - while Twitter had been (very) slowly adding more users over the past year and a bit, their latest numbers show that growth has stalled. What's worse, see that blue, 'US' block at the bottom of the column? That's right, Twitter actually lost two million monthly active users in the US for the period. While that loss has been offset by slight international growth, a decline in US users is a big problem. Why? As you can see, despite Twitter having more users outside America, the majority of Twitter's revenue still comes from US users. 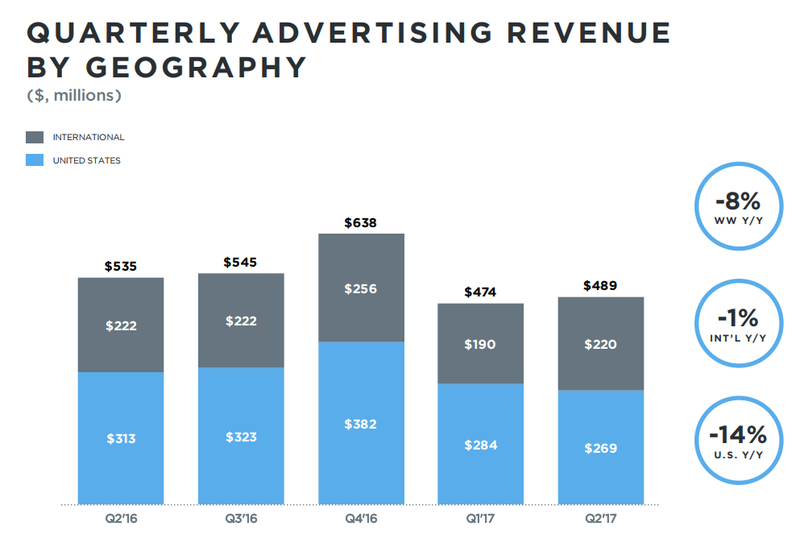 That says a lot about Twitter's growth struggles more generally, and their inability to convert their audience into revenue - but more operatively, right now, that's only going to make Twitter's path to sustainability more difficult. Less users means less eyeballs, which ultimately equals less ad dollars. What's more, Twitter is probably, right now, in its most high profile position ever. Almost every day, US President Donald Trump tweets out his latest thoughts on US policy, Twitter has become his exclusive channel, his way of connecting with the US people. His tweets are anticipated, analyzed and scrutinized by almost everyone. If Twitter's unable to capitalize on that attention and convert it into a growth opportunity, what else can they do? It seems unlikely that there's anything else that could gift the company a greater opportunity for exposure. But then again, that's not really Twitter's game plan anymore - knowing that they're going to be constantly, and unfavorably, compared to Facebook, Twitter has been trying to shift the narrative and embrace their niche status. The approach is similar to the one Snap Inc. is pitching - while they might not have as many users, what they do have, according to Twitter, is engagement. 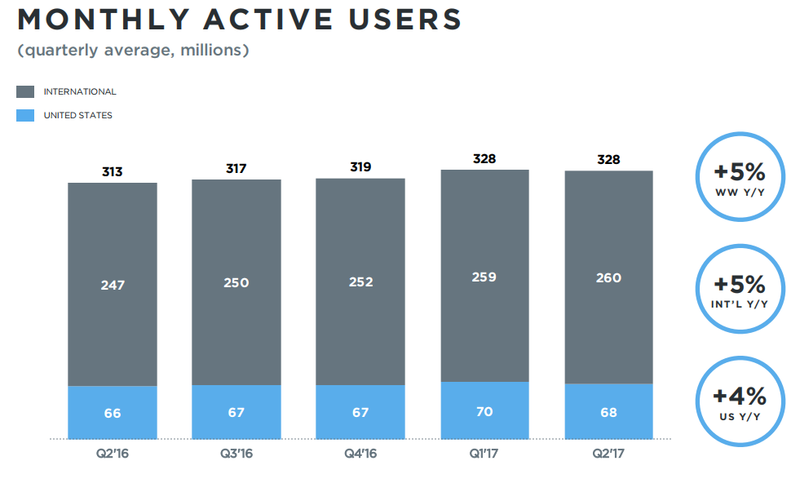 To that end, Twitter also provided this chart, showing that the amount of daily active users is still growing, despite the overall audience halt. That niche approach flows through to Twitter's live video strategy - while Facebook and other players are trying to muscle in on the live content market and build their status as genuine TV rivals, Twitter's broadcasting more niche content. The National Lacrosse League. The World Halo Championships. College Sports. None of these will have the broad audience appeal of, say, the NFL, which Twitter is no longer broadcasting after Amazon bought the rights to Thursday Night Football (which Twitter held last year), but they do have very passionate, dedicated audiences, to whom Twitter is hoping to become an essential companion for. Broadcast enough of these smaller-scale events and that audience might combine to be a big one, and one with a very specific focus for advertisers. You wanna' reach engaged lacrosse fans, you need to go to Twitter. The process makes sense, but it's a long bet - it'll take a long time for Twitter to be able to combine those audiences, Voltron-like, into a significant enough mass to challenge for real ad dollars. Maybe longer than Twitter has to prove itself - already, the stock had fallen to nine-month lows in response to their latest results. But still, that, also, is what Twitter's selling - live video broadcasting on the platform is up 400 hours on the last quarter, and 10 million viewers. And while those numbers show promise, we're probably beyond the time of promise for Twitter. The 11 year-old company needs to deliver, and today's numbers suggest that they're not close to doing that. The figures are only made worse by Facebook's latest performance report - in the latest quarter, Facebook added 2 million more monthly active users in the US, and 70 million more MAU overall (equivalent to 21% of Twitter's entire audience). So what does this all mean for Twitter? It's certainly not good news, but does that mean the platform is on the way out? Will it be acquired by some other tech giant who sees a way to convert its ubiquitous position into profit? Should you bother spending money on Twitter ads? The acquisition talk is likely to ramp up again in light of these numbers - and remember, Twitter was reportedly seeking offers last year, with several potential buyers (including Disney and SalesForce) pulling out due to concerns about the platform's issues with trolls and user safety. 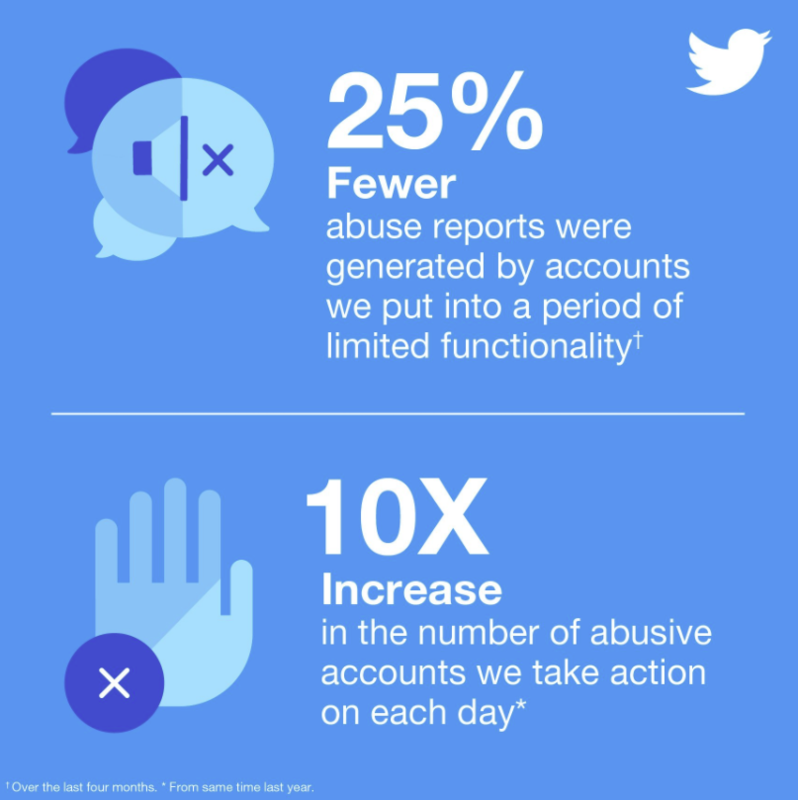 Which Twitter has highlighted as another key area of improvement in their latest figures. Maybe the company's already positioning itself for this scenario - and definitely, a Twitter owned by, say, Google would be a very interesting prospect. Expect the chatter around this to ramp up in the second half of the year. Should you bother with Twitter ads despite lower growth? As always, it depends on your audience. Per their strategy, Twitter's video efforts are bringing more niche, specific groups to the platform, a platform which remains a key part of many people's interactive process - 328 million users is still a lot of people. Some brands have seen, and are seeing, significant benefit from Twitter ads, and it's always worth investigating your audience behaviors, and available options with which to reach them. But then again, the narrative of the platform being in decline will no doubt spook a lot of potential advertisers, especially big brands looking to reach the widest possible audience - the ones who spend the most on ads. The figures will make it harder for Twitter to land those larger players, which will no doubt add more pressure to the bottom line. In the broader sense, this is a big problem for the company to address, but on a smaller scale, there may still be significant value in Twitter advertising for your brand, despite the wider decline. As always, Twitter remains an intriguing prospect - a hugely influential, significant platform which seems unable to convert that position into a sustainable business. Can it bounce back, or will it become the next platform to be eaten up by the growing dominance of the larger players? The next six months look set to be significant.